Excel SMALL function can be used to get the Kth smallest value from a range of cells or array. For example, you can get the 3rd smallest value from a range of cells. It returns the value which is the Kth smallest value from a range of cells. 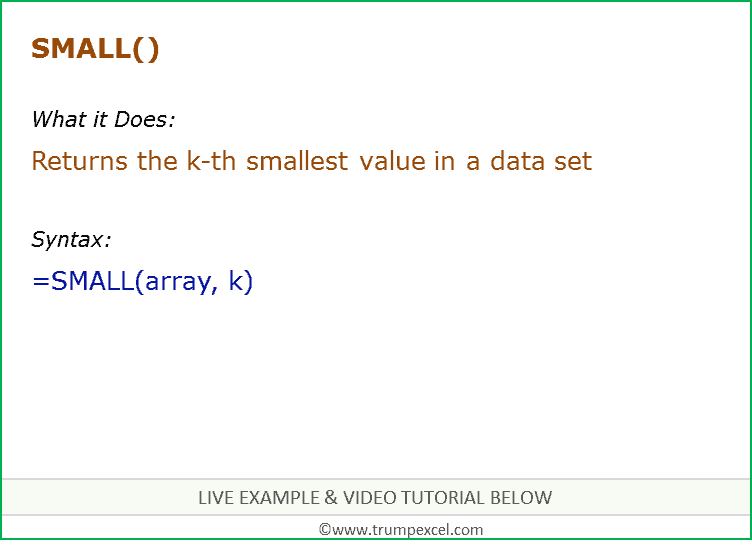 array – the array or range of cells from which you want to fetch the kth smallest value. k – the rank or position (from the bottom) of the number that you want to fetch. If the array is empty, SMALL returns the #NUM! error value. If k ≤ 0 or if k is greater than the number of data points, SMALL returns the #NUM! error value. If n is the number of data points in a range, then SMALL(array,1) returns the smallest value, and SMALL(array,n) returns the largest value. Here the Kth value is 1, which would return the smallest number from the range of numbers. Since the Kth value in the formula is 2, it returns the second smallest values from the range of numbers. If there are any blank cells in the range, it is ignored by the small function. For example, in the above example, while we take the range of cells as A2:A5, the blank cell is ignored by the SMALL function while returning the smallest value from this list. Similar to blank cells, Excel SMALL function also ignores cells with text, alphanumeric characters, special characters, and logical values. If there are duplicates in the range used in the Excel SMALL function, it will treat those duplicates as consecutive values. In the above example, two cells have the value 1. Now when you use SMALL function to return the smallest and second smallest value, it returns 1 in both the cases. If there is an error in any of the cells used in the Excel SMALL function, it will return an error. I like the concept, but I want to know this, if I want the smallest number among 3 cells which contains no number, why must the answer be #NUM!